I was geeked to ask Maurizio (Zanella) about the now legendary trip he made with Luigi Veronelli to California in 1981: Veronelli wrote 1982, but Maurizio told me 1981 last night). Giacomo Bologna was with them, too. 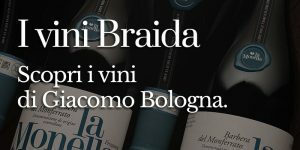 Bologna returned and created Bricco dell’Uccellone — probably the first and definitely the most famous barrique-aged Barbera.